Once upon a time, this was a post about how the Cubs lineup was a good matchup for the Mets pitchers. It’s what I’d planned to write if/when the Mets knocked out the Dodgers in Game 5 of the NLDS, but then Corey Seager forgot to cover third base and Andre Ethier caught a foul ball so that became a thing instead. Now, here we are. The Mets-Cubs series was billed as a battle between New York’s young pitching and Chicago’s young hitting. There were a couple things in the numbers that initially led me to believe the Cubs might have a neutralizer but, so far, it’s been all Mets. That neutralizer was fastballs. The Mets pitchers, see, throw a lot of fastballs. Correction: the Mets pitchers don’t throw an unusually high number of fastballs; the fastballs they do throw, though, you notice. Think Jacob deGrom, and you think fastball. Think Noah Syndergaard, think fastball. Matt Harvey pops into your head, you probably think “pitch count” or some similarly annoying storyline, but after that, you think fastball. That’s not to say the Mets’ fantastic young rotation doesn’t have other good pitches, too, but, if you’re like me, it’s the fastballs that stand out. They all throw them hard, and they all throw them well. Theoretically, a team that stands the best chance against the trio of deGrom, Syndergaard and Harvey is one that can hit the hard fastball. Harvey and deGrom throw 95. Syndergaard throws 97. The Cubs, this year, had the second-best slugging percentage in the league against fastballs 96+. An arbitrary cutoff, sure, but the point is: high heat hasn’t crippled the Cubs. Guys like Kris Bryant, Anthony Rizzo and Kyle Schwarber — can’t just blow it by them. There’s got to be other ways to get them out. Let’s now turn our attention to Schwarber in particular. Until Daniel Murphy started happening, maybe no other player did more in the postseason to make a name for himself than Schwarber. When he’s hit the ball, mostly, it’s gone a long way. He hit one into a river, and rivers don’t happen inside baseball stadiums. He hit one onto a roof, and that roof now has a shrine on it. Anyone who didn’t know about Kyle Schwarber before, knows about him now. Same goes for pitchers. You hear about the league adjusting to young players who come up and experience immediate success. The book getting out. Weaknesses in a hitter can reveal themselves by the way the league begins pitching to them. Each month, fewer fastballs, reaching a new low in October. Each month, more breaking pitches, reaching a new high in September and remaining there for the playoffs. The numbers, they aren’t staggering. Schwarber, he’s slugged .563 against fastballs. Against non-fastballs, it’s .483. Schwarber can do damage, it seems, against any pitch, but pitchers can see more than just numbers, and what the pitchers see directly influences what the pitchers do. What the pitchers have done is stop throwing Kyle Schwarber fastballs, and the Mets have taken that approach to a new extreme. They saw what Schwarber did to the Pirates, and they saw what he did to the Cardinals. They saw him get the best of Harvey, too, with a meaningless eighth-inning home run in Game 1, but, beyond that, Schwarber’s been held in check by New York pitching. Last night, he struck out thrice, and the dinger is his only hit of the series. I should note: this certainly isn’t being written because Schwarber is struggling, it’s being written because Schwarber’s been arguably the best hitter in the postseason thus far, and so each Schwarber at-bat carries a greater sense of magnitude. Drawing a conclusion from the results of eight at-bats is silly, of course, but the process can always be worth looking into. Harvey’s first sequence to Schwarber lays the groundwork for the Mets’ gameplan against him, so far. He starts Schwarber out with a well-located curveball, comes back with a changeup, speeds Schwarber up with a fastball and gets him to chase a curve for strike three. Everything is low. Fastball count: 1. Gameday went ahead and broke itself for an inning in Game 1, so there’s no footage of the at-bat, but you’ll have to take my word for it that the sequence went: first-pitch curveball, followed by changeup, sped up with a fastball. Same as the first. This time, Schwarber roped the fastball up the middle, but into the glove of Wilmer Flores. Fastball count: 1. After two first-pitch curveballs, Harvey this time goes first-pitch changeup and gets Schwarber to chase and whiff. He comes back with a curveball way up in the zone, and curveballs up in the zone usually indicate a miss, but high curveballs can have their purpose and sometimes they’re intentional. Regardless of intent, this one did its job, as Schwarber weakly tapped it back to the pitcher. Fastball count: 0. For the fourth time in as many at-bats, Schwarber is started off with a non-fastball. Then, Harvey comes back with a well-located heater, up-and-away, and Schwarber hits it a mile. He saw three fastballs all night, swung at two of them, and crushed them both. Against the rest of the pitches: zilch. Fastball count: 1. We’ve now moved onto Game 2, where Syndergaard hits Schwarber with a particularly filthy sequence, spotting a first-pitch curveball for strike one before getting Schwarber to chase two perfect changeups low-and-away for a whiff. Everything is low. Fastball count: 0. The first pitch is, gasp!, a curveball. Then another, followed by a harmless sinker way out of the zone and a perfectly spotted fastball at 96 on the black for the strikeout. Schwarber finally saw more than one fastball in an at-bat, but only once Syndergaard was comfortably ahead in the count, and the locations of the fastballs put Schwarber in a position where he’d be hard-pressed to do anything with them. Fastball count: 2. Finally, a first-pitch fastball! Just, one that had no chance of being hit. Schwarber gets a couple more heaters, but ends up fanning on a well-located changeup. Everything is low. Fastball count: 3! We’re now passed Syndergaard and onto Tyler Clippard, who gives Schwarber a first-pitch changeup, and a second-pitch changeup, and a third-pitch changeup and a fifth-pitch changeup, resulting in a flyout. Fastball count: 1. In eight at-bats, Schwarber has seen 29 pitches thrown by Mets hurlers. Of those 29 pitches, 20 of them have been breaking or offspeed pitches. The couple fastballs he’s seen that were hittable have been hit, and hit hard, reinforcing the idea behind New York’s approach against the monstrous slugger. As Kyle Schwarber’s season went on, the league adjusted. As the season went on, he saw fewer and fewer fastballs, and it’s led to this. By the end of the regular season, he was getting a fastball just a hair over half the time, in a league where the game’s best fastball hitters check in with fastball rates of around 48%. In this Mets series, Schwarber’s fastball rate has been 31%. Just eyeballing this chart, it’s the lowest rate of fastballs Schwarber’s seen in consecutive games. Schwarber’s shown he’s not helpless against non-fastballs, but the Mets have made the first move. Now, it’s up to Schwarber to counter. We hoped you liked reading The Mets Are Following the Kyle Schwarber Trend by August Fagerstrom! Schwarber is one of the best hitters in baseball. He will adjust. You could say the Mets pitchers are just getting lucky, and Shea is cold and big. We’ll see how far those Mets fastballs go out of the park over these next three games. Expect lots of home runs and Cubs to be up 3-2 heading back to New York. The Mets don’t play at Shea anymore, but Citi Field doesn’t look too cold and big when Jon Lester is pitching. Schwarzer is one of the best in the World Cup and shock. It will adjust. Food glasses happiness and Shea is large and airy. To see how quickly and metastases going to the park in the next three games. Expectations of operators and Panda Title To The New York 3-2. He’ll have to eat a bit more to win the Panda Title! There will be plenty to eat at the Jeff Sullivan Salmon Feast! Loved this comment. That is an equation I can get behind. Never understand what people get out of this kind of rooting in the comments. Weak attempt at trolling. In honor of Kiley’s departure, I’ll give you a 30 CV with a FV of 35 if you can improve your instincts. Given your (estimated) age of 33, I’m not sure how likely that is. He was 33 when I gave up trying to kick him out of my basement. Ten years ago. Awwww, don’t cry. You’ll always have your 2015 NL Central BaseRuns Champ trophy to hug and cherish! May I present to you a young player, on a team I happen to live near, that came up in 2012 and proceeded to hit 344/360/634/994 in his first two months and 150 AB’s (Schwarber had 230 AB’s, and hit 246/355/487/842 this year). His name? Josh Rutledge, whom I believe the Red Sox, his third team, are about the cut. Schwarber is promising, but he’s not even in the top 10 ROOKIE hitters this year. He’s a big lunk with an uppercut swing that has great patience and monster power. He’s a good major league player. But so far, he’s far from elite. Didn’t the Cubs have baez in the hall of fame after 10 games, were soler schwarber last year? no one said that about baez. he had one amazing home run that flashed potential. again bringing up a player with poor plate discipline and comparing them to someone with elite plate discipline is a waste of time. add in the fact that a lot of baez value came from defense and baserunning as a whole package. society loves to create comparisons that fit their narrative. To say Schwarber is presently far from elite and not one of the best hitters is to not be looking at the numbers, though. He’s putting up a 274 wRC+ through 7 postseason games. He has a .435 OBP and .952 slugging. 4 HR+SB and 11 R+RBI in only 23 PA. In 2004, Carlos Beltran hit 1 HR every 7 PA. Schwarber is currently hitting 1 HR every 6 PA(!). These are ridiculously elite numbers, both real life and fantasy. The issue there is small sample size, not suckitude. The more controversial part of CubsTime’s comment is the second sentence, not the first. 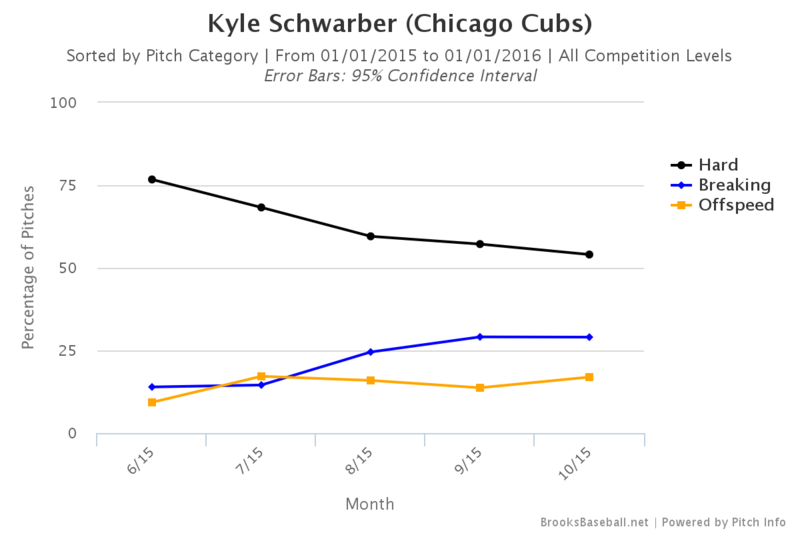 Will Schwarber adapt over time to what pitchers do to him? Who knows; the guy is only 22 years old. But whatever happens in the future, what Schwarber has done in his first 296 MLB PA is quite good. Also, you might be interested in Kiley’s rankings of graduated prospects this summer. The notion that Schwarber isn’t even a top 10 rookie hitter strikes me as pretty bizarre without some clarification on what you mean. Schwarber is one of the best young OF in the game. “Quite good” and “elite,” “one of the best hitters in the game” are not the same thing. I’m going to ignore you using the small playoff sample size which would say Daniel Murphy is either Ted Williams or Babe Ruth reincarnated and instead use the half season numbers you quote. Since you point out all the big name players that Schwarber’s half season sample size was better than, I can’t help but point out it was the same as Kendrys Morales, who’s on his 4th team in 4 years and was recently traded for the immortal Stephen Pryor. It’s also lower than guys like Danny Valencia, Brandon Belt, Stephen Piscotty, and Andres Blanco. I’m not saying Schwarber doesn’t have massive potential, but calling him a star based on 296 PA’s where he was behind some players who are clearly NOT stars is not quite right. Agreed. It really comes down to what is meant by ‘far’ from elite. I mean, there are only about three guys that are one of the best hitters in baseball if we want to pick one who is the best. But the Cubs are about to get knocked out of the playoffs painfully. Let ’em have a little fun. This is what was so fascinating about the Cubs-Mets matchup. Organizational development philosophy of some of the best position players vs some of the best pitchers. Of course neither team has Kershaw or Harper. What I found interesting about this comment was the hyperbole the other direction, going so far as to say that Schwarber isn’t even a top ten rookie. Umm…. Schwarber one of the best hitters in the game? You have a very loose definition of hitter. He can CRUSH homeruns yes but a .246/.355/.487/.842 slash line is nothing to swoon over. How are the Mets pitchers getting lucky? They have overwhelming command of all of their pitches and made the Cubs look bad. Let’s be fair here, the Cubs are a team that likes to strike out. They’re over aggressive at the plate and the Mets exploited that. Homeruns at Wrigley mean very little if you’re not making contact with the ball. Which very little of your hitters did against the Mets’ starting pitchers. The Mets have struck out 18 times to the Cubs’ 20 over these past two games. An .842 OPS is top 50 in baseball, same ballpark as Jose Abreu, Freddie Freeman, and Buster Posey. It’s the 20th-best OPS by a rookie (min 200 PA) going back to 2010. Your assertions are questionable and you should feel questionable. Your assertions that one statistic puts him on par as three of the top hitters in the game are also questionable. He’s not even top ten of hitters in baseball. I’m not denying he’s a good hitter, but to say he’s one of the best is absurd. Especially with a particularly low batting average and a small sample size. You’re on FanGraphs referencing batting average??? Anthony Z, you made one questionable assertion baldly, and cited a (rather poor) statistic without context. I merely provided additional information so that a reader might not be misled into thinking you are correct. He’s above league average in OBP, SLG, and OPS, but not by much. At best he’s an above average hitter. However, his sample size is AB count is too small considering he has less at bats in the top 15 who all outlast him in said statistical categories. He’s a good hitter yes. But one of the best hitters in baseball? I don’t see it. Schwarber’s WRC+ for the postseason is 274. For the regular season it was 131. Regardless of the team you’re cheering for, he’s a good hitter. Speaking for the Mets fans I know, we may think Schwarber is corpulent, and we may think he has top 10 bad chin hair, but we also find him completely terrifying. The ball he hit off Harvey was offered a complimentary bag of peanuts…he’s legitimately terrifying right now as a fellow Met fan. Among players with at least 250 PAs, that OPS would rank 35th–so about one hitter of that caliber (if that’s the stat you choose to rank hitters) per team. I’d say that if you can walk onto a random team and reasonably expect to be the best hitter on the team, it’s fair to say you’re one of the best in the league. I think the luck he’s referring to is several hard-hit balls that went for outs. I’m sure even the Mets pitchers would tell you they’d prefer not to be giving up such solid contact, and that they would not expect to continue keeping the run count low if they continue doing so. Contrast that with what’s happening on the Mets side (e.g., Murphy putting a good curveball into the stands with a one-handed golf swing) and it’s fair to say that luck has been on the Mets’ side and has played a non-trivial role. But such things are part of baseball, and are not an indictment of your beloved Mets. The Cubs are overly aggressive? They led the NL in walks in the regular season, and are doing it in the postseason as well. They strike out a lot in large part due to taking a lot of pitches and frequently running the count full. Much of this is strategic (i.e., desirable) and nobody is losing any sleep over most of those strikeouts. The Cubs aren’t striking out much more than the Mets, and they’ve made some pretty nice contact. Bryant and Coghlan both hit balls in game 2 that would have likely gone out on a warmer night at Wrigley (the kind of warmer night that’s forecast for the next few days). So did Cespedes, but my point isn’t that the Cubs should be ahead or tied in this series–it’s that you aren’t making a very good case for whatever it is you’re trying to claim. Soooooo…. 3-2 Cubs, you say?